Lenovo remained in the top spot in the first quarter of 2019 with the largest year-over-year growth among the top vendors. However, Lenovo benefited from the inclusion of Fujitsu's shipments from its 2Q18 joint venture. Lenovo's shipments increased in EMEA and Japan, where Fujitsu had a larger presence. Business PC demand remained strong throughout the first quarter of 2019 across most key regions. The PC refresh driven by Windows 10 has been a driving force of business PC growth over the past three years, but Gartner forecasts that 2019 will be the last year in which shipments will be impacted by this refresh. While PC shipment results in the first quarter of 2019 indicated that the business PC segment still showed strong demand, weak mobile PC results could be the indicator that the Windows 10 refresh has nearly peaked, said Ms. Kitagawa. In the U.S., PC shipments totaled 11 million units in the first quarter of 2019, a 6.3% decrease from the first quarter of 2018. HP Inc. took the top spot in the U.S. based on shipments, as its market share increased to 29.4%. Dell took the No. 2 position as its shipments declined 7.1%, and its market share totaled 28.7% in the first quarter of 2019 (see Table 2). Japan was the only region to experience PC shipment growth in the first quarter of 2019 with a 6.8% increase year over year. 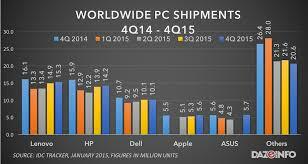 This was primarily driven by a surge in business PC shipments. Latin America experienced the largest decline in the quarter with a 16.6% decrease in PC shipments. This decline was due to a lack of stability in political and economic environments, as well as the CPU supply constraints, which severally impacted the small system builders in the region. PC shipments in EMEA totaled 18 million units in the first quarter of 2019, a 2.2% decline year over year. Enterprise shipments increased as many companies moved ahead with Windows 10 deployments. However, consumer PC demand remained weak as users are not replacing older PCs and are not migrating to hybrid systems, which have not gained wide adoption in EMEA as users continue to prefer larger screens. PC shipments in Asia/Pacific totaled 20.1 million units in the first quarter of 2019, a 5.1% decline from the first quarter of 2018. This decline was largely due to weak PC demand in China. The consumer market across Asia/Pacific continued to see some growth driven by demand for thin and light ultramobile premium devices. Vendors such as Huawei and Xiaomi are pushing thin and light mobile PCs into the consumer market with aggressive pricing. We saw the start of a rebound in PC shipments in mid-2018, but anticipation of a disruption by CPU shortages impacted all PC markets as vendors allocated to the higher-margin business and Chromebook segment, said Mikako Kitagawa, senior principal analyst at Gartner. While the consumer market remained weak, the mix of product availability may have also hindered demand. In contrast, Chromebook shipments increased by double digits compared with the first quarter of 2018, despite the shortage of entry-level CPUs. Including Chromebook shipments, the total worldwide PC market decline would have been 3.5% in the first quarter of 2019. The supply constraints affected the vendor competitive landscape as leading vendors had better allocation of chips and also began sourcing alternative CPUs from AMD, said Ms. Kitagawa. The top three vendors worldwide were still able to increase shipments despite the supply constraint by focusing on their high-end products and taking share from small vendors that struggled to secure CPUs. Moreover, the constraints resulted in the top vendors shifting their product mix to the high-end segment in order to deal with the constraint - which, along with favorable component price trends, should boost profit margins. The top three vendors - Lenovo, HP Inc. and Dell - accounted for 61.5% of global PC shipments in the first quarter of 2019, compared with 56.9% of shipments in the first quarter of 2018 (see Table 1). These top three vendors continued to gain share in the PC market as scale becomes a bigger factor in industry dynamics. Intel's CPU supply constraint accelerated this trend.